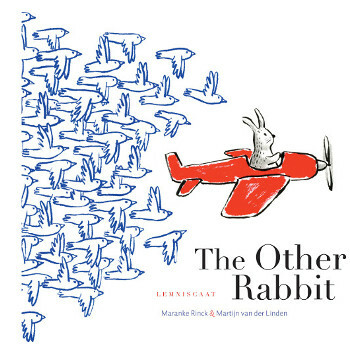 Here’s a quick post to show off the artwork of Dutch illustrator Martijn van der Linden, who illustrated Maranke Rinck’s The Other Rabbit (Lemniscaat). I believe this book was released here in the States last Fall (and it may have even been released in the Netherlands the same year, though I’m not sure about that), and I’m just slow in getting to it. Better late than never. I like this enchanting import. It opens with two spreads that show a memory game in process. You know, like this. One card has been overturned, and it shows Rabbit. “Rabbit,” the text says, “is looking for the other rabbit.” On the next memory-game spread, we see that, instead of another rabbit, there is (on another overturned card) an airplane. 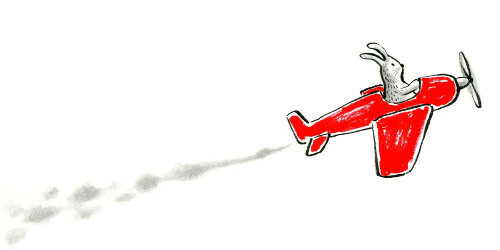 Rabbit hops in the plane (the spread featured above) to find the other rabbit. 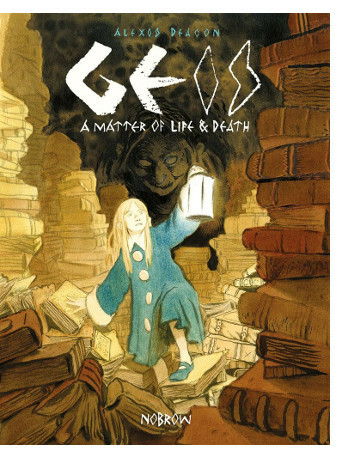 Let me back up a bit and say that I love to see Alexis’s work, and I was happy to see he’d done a graphic novel. (I just read this 2014 Guardian piece about him and very much enjoyed it, if anyone wants to learn a bit more about him.) This is what the publisher calls a supernatural historical fantasy and is the first in a trilogy. Readers are promised at the book’s close that “soon” we will be able to read Book Two, A Game Without Rules. The book opens with the death of the great chief, Matarka. Her will declares that “there would be a contest. Fate would choose the one fit to take her place.” Calling upon the Gods, fifty souls are summoned at night — to the confusion of everyone. Thus begins the contest to see who will become the ruler of the island. 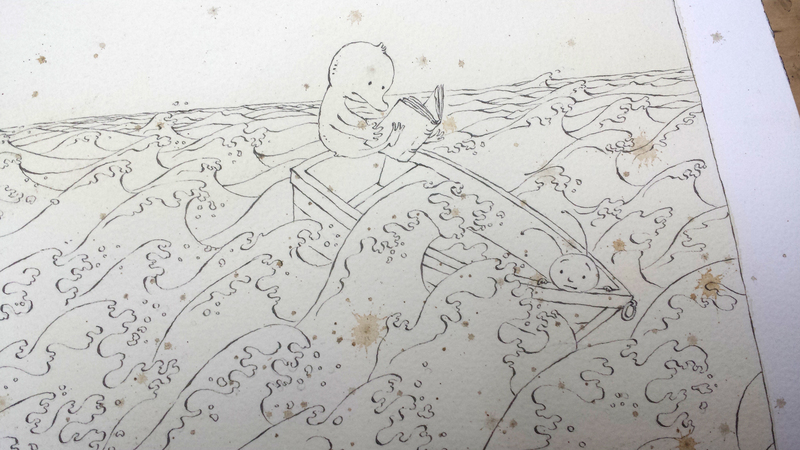 Today at Kirkus, I’ve got something a bit different — a thank-you to teachers who read aloud in the classroom. That is here. 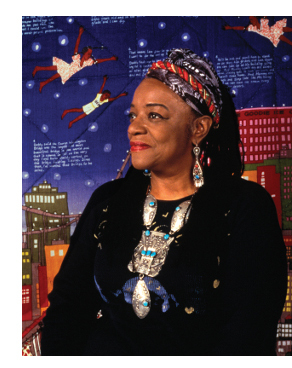 Over at Kirkus today, I talk to author-illustrator Faith Ringgold, pictured here. Tar Beach, her first picture book and a Caldecott Honor book, is 25 years old this year. At Kirkus, we talk about that and her new book, We Came to America. That is here this morning. Photo of Faith Ringgold taken by Grace Matthews and used by permission of Knopf. Arriving on bookshelves in September (Candlewick) will be Oliver Jeffers’s and Sam Winston’s A Child of Books, and today I’ve got a little sneak peek. First, they have created one of those newfangled book trailer dealios (to be exact) for the book, which is above. (It’s always fun to hear that Belfast accent.) Also, I have a wee tiny Q&A with the two below, and best of all, I’ve got two spreads from the book. The book is a celebration of reading and words and story and has been described as a “prose poem.” It features a sort of orphan, a young girl who is “a child of books” and whose home is a “world of stories.” She invites a young boy to join her on a journey in her imagination, one buoyed by a love of narrative. The art is playful, incorporating the text of iconic children’s stories (apparently, forty of them), and even, at one point, lullabies. There’s a lot for observant readers to pore over in this book. As you can see here, typographic artist Sam Winston was the perfect collaborator for this one. (“A continuing theme is his exploration of the hidden narratives found in canonical bodies of text.”) Here is a 2014 interview with Sam at typorn, and I’ve featured Jeffers’s work several times here at 7-Imp, but here’s my 2010 breakfast interview with him. They talk a bit below about their collaboration on this project. 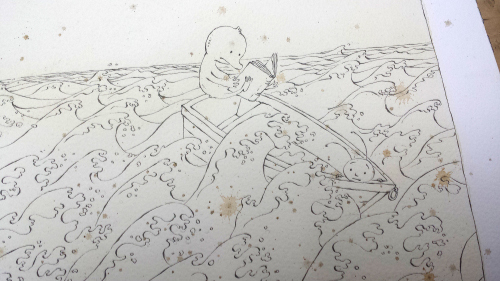 I’ve got a review over at BookPage of Tarō Gomi’s Over the Ocean, originally published in 1979. If you’d like to read about the book, I send you there. 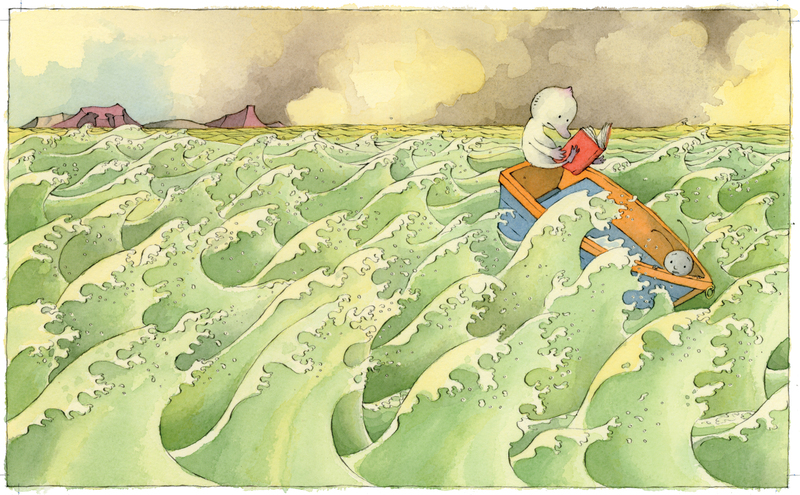 And if you want to see some art from it, I’ve got that here at 7-Imp today. 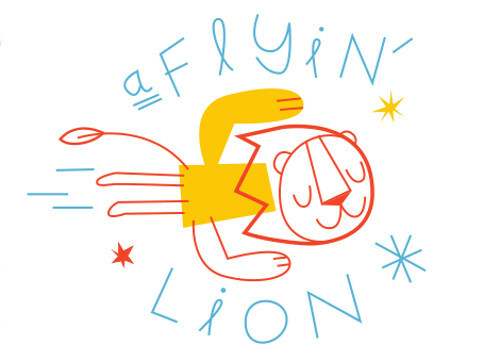 This morning over at Kirkus, I have a Fall 2016 Picture Book Preview. That is here. I thank Sergio for sharing. I love to see these early images and the book’s evolution. 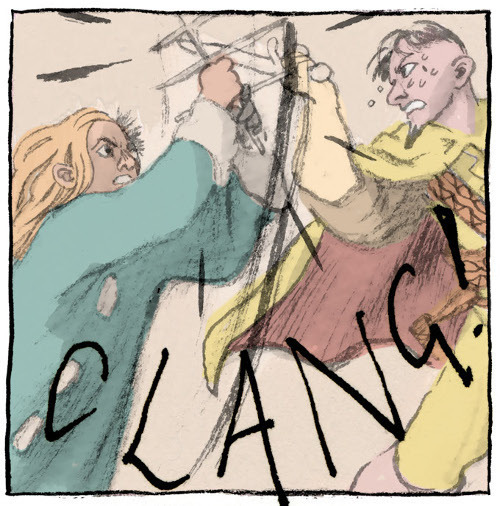 And there’s a bit of final art below, too. 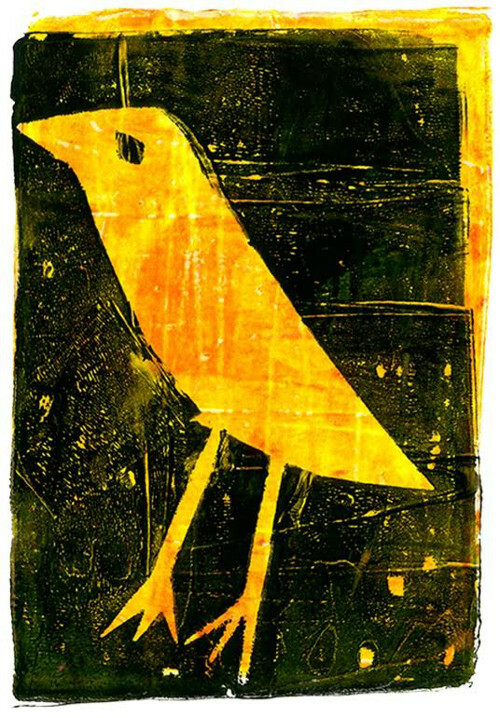 Pictured here is a gelatin print from author-illustrator Denise Fleming. She’s experimenting, while working on some new books. 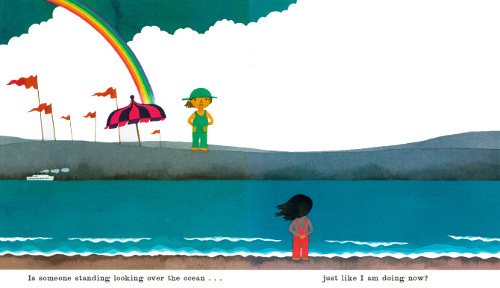 Since she chatted with me last week at Kirkus (here) about her latest picture book, Maggie and Michael Get Dressed (Henry Holt, April 2016), I wanted to follow up today here at 7-Imp with some images and art. She shares quite a bit of process art below, which is fascinating to see — and will have to do, since I can’t just pop over to her house and watch her do her thing. I thank her for sharing. I always like to see the work of Kevin Waldron. 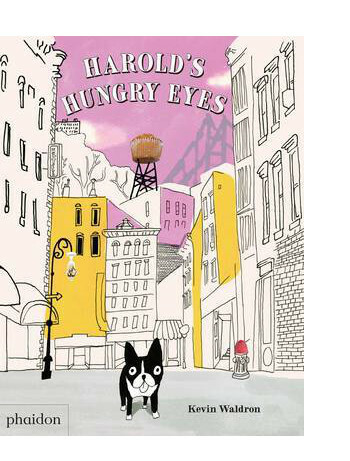 His newest picture book, Harold’s Hungry Eyes (Phaidon Press, May 2016) is funny stuff. 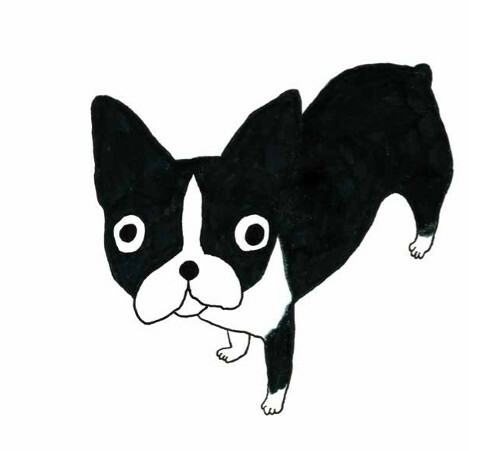 It’s the tale of a hungry dog, living in the city, who is “insatiably hungry. All of the time.” The only thing he likes about as much as he loves food is his comfortable chair, but one day, he discovers a garbage truck in the process of ditching his favorite place to sleep. After he heads outside to chase the truck, he becomes lost. And then his stomach rumbles: “Harold hadn’t had his breakfast!” His new goal, other than finding his way home, is to find food. And he sees food in nearly every nook and cranny of the city, his mind’s eye filled with veggies where a park is, pretzels where bicycle tires normally go, wafer cookies as steps, ice cream cones where stoplights would be, and much more. 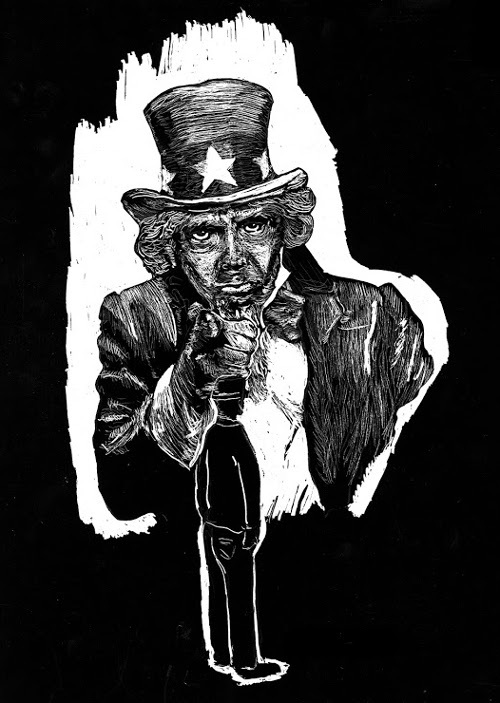 Today I’ve got a bit of art from Carole Boston Weatherford’s newest book, You Can Fly: The Tuskegee Airmen, illustrated by Jeffery Boston Weatherford and released by Atheneum this month. 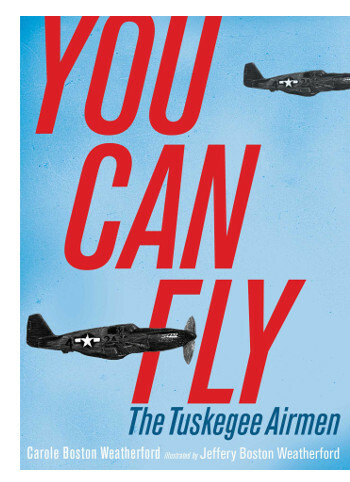 This is a series of poems, aimed at middle-school readers, about the Tuskegee Airmen of World War II.